For as far back as I can remember, Easter was special in my family. I grew up overseas in nine different countries, so our traditions had to be flexible and adapt to what was available locally. For example, one year, we lived in Sudan and we dyed Ostrich eggs and then my mom tied bows around the eggs and used them as centerpiece decorations for the Easter table. That’s one of my favorite Easter memories. My mother would go all out each year and set a beautiful table; she’d carve grapefruits into baskets and fill them with fruit to start each Easter meal. It was a lot of work, but so beautiful to behold. Dye Easter eggs and once the eggs are dry, use a glitter pen to write the name of each guest or family member on the egg. Then go to a dollar store and buy candle holders to display the egg and use those as place settings. You can buy candle holders of varying heights for a more dramatic look. A dollar store is a great place to buy festive ribbon and tie it around a napkin with cutlery. If you’re fortunate enough to have daffodils (or another flower) in your yard, tuck a flower under the ribbon. Try mason jars filled with candy eggs or jelly beans and chocolate bunnies on top; or mason jars filled with jelly beans and daffodils. If you have a big Easter celebration and use plastic cutlery, I saw an adorable idea on Pinterest: buy green plastic cutlery, use orange napkins to wrap around the cutlery, and tie it all together with green ribbon, so it looked like a carrot. This is an easy idea and a fun job for kids. Now, on to the food. In our house, the ham is the centerpiece, but here’s a wonderful side dish to accompany the ham. My potatoes au gratin are simple to make, there’s no peeling the potatoes. I make them with extra sharp cheddar cheese. If you like cream, cheddar cheese and potatoes, I think you will enjoy these. This dish goes well with beef or lamb, too. It’s simply layers of thinly sliced potatoes, cooked in heavy cream that is lightly infused with bay leaves and thyme and loaded with cheese. Does that sound heavenly or what? In a heavy bottom pot, add butter, heavy cream, bay leaves and thyme leaves. Heat over medium-low heat. Do not use high heat or your cream will curdle. Bring to a light simmer and stir. Reduce to low. Wash potatoes and thinly slice them. You want potatoes to be as uniform as possible, so if you have a tool, like a mandolin or cheese grater that has a slicer on it, use those. Grease a 9-inch deep dish pie pan or baking dish with butter. Place the first layer of potatoes down and add salt and pepper to the tops. Then sprinkle about 1/3 cup of the cheese over potatoes. Add the next layer or potatoes being sure to add salt and pepper directly on the potatoes. Add about 1/3 cup of cheese on that layer. Repeat this process until you have four layers. Then pour the cream mixture into the baking dish. Top with remaining cheddar cheese. Cover with aluminum foil and bake for 50-60 minutes. Remove foil and bake 5-10 minutes more (test potatoes to be sure they are done. You can insert a toothpick to determine if they are cooked). Allow to rest 5-10 minutes before slicing. 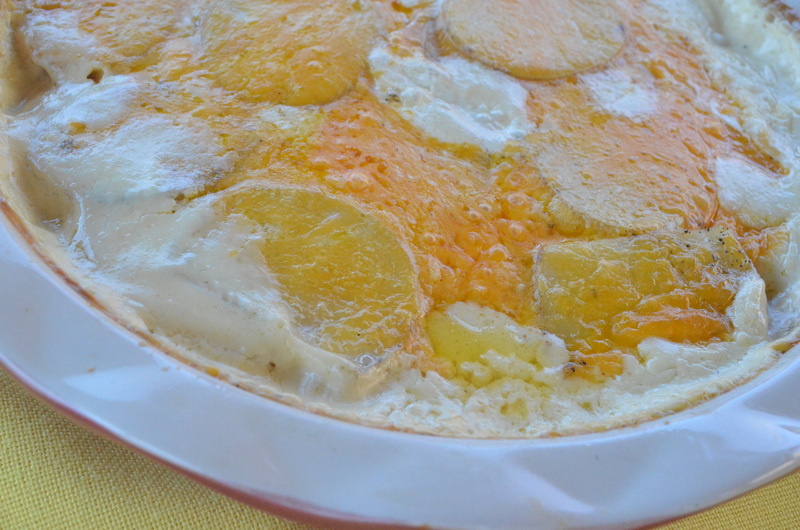 This entry was posted in Side Dishes and tagged au gratin, cheddar cheese, cream, delicious, Easter, easy, heavy cream, potatoes, side dishes, special occasion on April 3, 2015 by Juliana Goodwin. I am still taking a break from my rotisserie chicken recipes to offer up some Easter dishes. Easter is one of my favorite holidays. Easter would not feel like Easter without deviled eggs. My Wasabi and Cucumber Deviled Eggs are delicious and refreshing. There’s enough wasabi to taste it, but not enough to make your nostrils flare. Whenever I cook for company, I try to find the middle of the road in terms of flavors. You can add more if you love wasabi or know your guests won’t mind extra heat. I am actually pretty traditional when it comes to deviled eggs, but I love these. It’s a slight twist on a classic. Whenever I make hard boiled eggs, I always boil two or three extra because there’s always one or two eggs that is deformed or rips when you’re peeling it, so extras are essential. My recipe calls for six, so boil eight or nine. If you’re fortunate enough that they all work out, you can fill extra egg whites with deviled egg mix because there is always leftover yolk mix once everything has been mixed in. If you have a favorite boiling method, use it. If not, follow mine. To boil the eggs: Place eggs in a large pot so they are in a single layer and fill with water that rises 2 inches above eggs. Put on the stove and bring to a boil. When it reaches a boil, boil for 5 minutes. Cover the pot with a lid and turn off the heat. Let rest 15 minutes. Drain water off and then scoop ice over eggs to cool. When cool, peel eggs and slice in half horizontally. Remove yolks and place in a bowl. Mash yolks with a fork and then add cucumber, Miracle Whip, wasabi sauce and salt and pepper to taste. Mix until well combined and mostly smooth. Refill egg whites with this mixture and cover and refrigerate until time to serve. This entry was posted in Appetizers and tagged Appetizer, cheap, cucumber, delicious, deviled eggs, Easter, easy, Miracle Whip, refreshing, wasabi, yummy on April 1, 2015 by Juliana Goodwin.